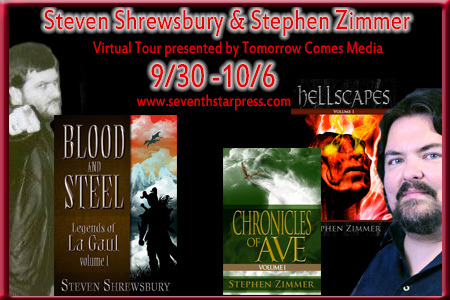 For background on Hellscapes and an interview with Stephen Zimmer, see my author spotlight. 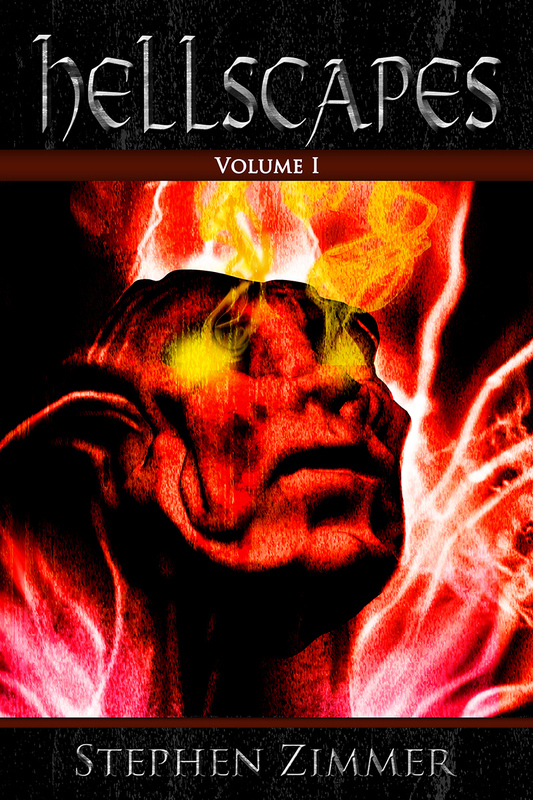 To launch the collection of Stygian narratives in Hellscapes, Volume 1, Stephen Zimmer cites three primary inspirations, maybe even masters: Dante Alighieri, John Milton, and Clive Barker. Zimmer is an accomplished writer with a voice all his own, so these citations are less acknowledgments of imitation than a map for readers who want to place where Hellscapes falls in the geography of literature: in one region, Dante and Milton, acknowledged world masters whom many remember hating in excerpts assigned during school, and in another, Barker, whose Books of Blood will (in this professor’s opinion) eventually get its due of immortality, but Barker ain’t in the mountains of Dante yet. What does this first of several mapping devices in Hellscapes tell us about what the five interwoven tales have in store? Luckily, a little bit of everything. Zimmer delivers classical visions of punishment and despair ringed with silver-tongued demons, but he wraps them up in fast-moving, 21st-century-accessible prose and adorns them with legions of monsters (giant rats, spider-wolf hybrids, even some rotting ex-people that are particularly popular at present, and more), most of grotesque proportions I can imagine bringing a smile to Master Barker’s lips. One of the things I like most about Hellscapes might turn off readers who expect short stories to follow the market formulae that still require narrative conflict-resolution arcs of the sort prescribed by Aristotle millennia ago. In other words, if a short story only makes you happy if the central character experiences some life-altering change that leads toward a satisfying conclusion, you might not be happy with this book. After all, most (not all–Zimmer’s got some surprises for you) characters are spiraling toward similar eternal destinies, even though the destinies outwardly take different and creative forms. However, if your happy comes not from rushing to endings but from vivid descriptions–moments that yield opportunities for felicities such as “sepulchral cacophony” and “surreal beast”–as well as thoughtful pepperings of metaphysics to spice up the plentiful eviscerations, then, my friends, Hellscapes is for you. Perhaps the stories in Hellscapes manage this feat, they break the tried-and-true formula for dynamic characterization and conventionally satisfying closure yet still remain compelling, because they work together more like a Winesburg, Ohio or a Joy Luck Club. They gather meaning and intensity as they accumulate, and while the closure of most individual tales might lack traditional resolutions, “twisty” or otherwise, the closure of the collection feels like a larger canvas (or, perhaps more accurately, a medieval triptych… did they have quintychs?) coming together. And for that reason, as readers go along, some might encounter a difficulty that I did. The stories mostly focus on the plights of the wealthy and powerful who have abused their positions and life, a fairly non-partisan political point that gives the book cohesion and moral force. However, the first three stories center on (in order) a woman, a man attracted to other men, and a man with a Hispanic name–all minorities in the halls of (American) money and power. Having minorities make up 3/5 of the damned who star in these tales made me… uncomfortable… but the decision makes more sense when the book as a whole comes together, and so does Zimmer’s discussion of those particular choices in our interview. In my imagination, several types of people might be reading this review. If you’re the type of reader who shares my love of the gruesome imagery in the movie Martyrs (2008) but could fast forward through all the rest of the stuff, Hellscapes might not be for you. But if you like the gruesome imagery and also share my conviction that horror and grotesque imagery stand out among the oldest and most venerable artistic traditions for good reasons–involving philosophy, politics, and all the rest–as well as the coolness of nasty beasties, then give Hellscapes a try.